In the early 20th century, Japanese artists reimagined traditional printmaking for the modern age, as revealed in a show at the Minneapolis Institute of Art. 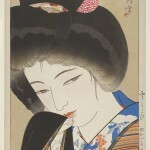 Ito Shinsui, A Woman in Western Dress, 1960, published by Watanabe Shozaburo, 14 x 16 inches. 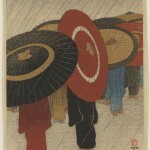 Friedrich (Fritz) Capelari, Umbrellas (Kasa), 1915, published by Watanabe Shozaburo, 10 1⁄2 x 8 inches. By the end of the 19th century, the 300-year-old Japanese art form of ukiyo-e (woodblock printmaking) seemed moribund. The public, weary of old themes and styles, was being seduced by Westernized arts, and the old methods of printmaking were being supplanted by new ones such as lithography and photoengraving. Ukiyo-e artists were being lured away to do illustrations for the newspapers. One master, Tsukioka Yoshitoshi, singlehandedly championed the traditional techniques, and his astonishingly dramatic and often macabre works, created in the twilight of ukiyo-e, are among its greatest achievements. When he died in miserable circumstances in 1892, it looked as if ukiyo-e would die with him. 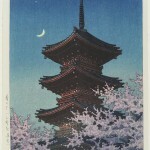 But less than 20 years later, Japanese woodblock printing was reborn. A small group of publishers and artists reimagined ukiyo-e in a form that fitted the economics and taste patterns of the early 20th century. In some ways, the new prints were actually of finer quality than the old ones. Traditional ukiyo-e were made by hand, of course, but they were mass-produced to the extent possible in their time, to reach as large a viewership as possible. The publishers of the new-style prints cannily recognized that to succeed in an era of mass-production, their artworks would have to be produced in severely limited editions. To deepen their appeal to collectors, the prints were executed with techniques that emphasized luxury, such as embossing the surfaces with relief texture and applying a silvery finish. Finally, artists began taking control of the entire printmaking process. In the old system, the artist only created a design in the form of a drawing; the carving of the block and the printing on paper were carried out by others. Yamamoto Kanae, a wood engraver who studied European-style art at the Tokyo School of Fine Arts, is credited with creating the first Japanese print wholly executed by one artist, without intermediaries, in 1904. Instead of ukiyo-e (“pictures of the floating world,” a reference to the geisha houses and nightlife scenes that were among the favorite subjects of the early artists), these works on paper were called shin hanga, or “new prints.” One of the best collections of shin hanga outside Japan—over 500 strong—resides at the Minneapolis Institute of Arts. Most were donated by an avid collector, Frederick B. Wells III, a trustee of the MIA who died in 2005. Currently, the museum is mounting “Seven Masters: 20th-Century Japanese Woodblock Prints from the Wells Collection” (through March 13), which shows how these artists and their publishers found a way to keep fine-art printmaking viable in the modern era. The story of shin hanga has a great deal to do with the encounter between between Eastern and Western aesthetics in Japan. During the Meiji Restoration, which began in 1868, European culture was aggressively imported, and by the turn of the century, Japanese art schools were teaching oil painting and urging students to model their work on classical European prototypes. Many shin hanga exhibit a mix of Japanese and Western aesthetics and subjects. Liberated “modern girls” (moga in Japanese) and movie stars loom large, and subtle gradations of color, unlike the bold flatness of ukiyo-e, were introduced to simulate European-style watercolors, particularly in landscapes. printmaker and graphic designer, Hashiguchi Goyo. While Goyo did some landscapes, including Shinto temples and snowy scenes reminiscent of Hiroshige, he specialized in images of beautiful women. Woman at the Bath (1915) is typical of his closely-observed, clean-lined approach. This print is sensual in a traditionally Japanese way, whereas other Goyo prints, such as Woman in Summer Clothing (1920) feature figures whose elongated, ultra-slim shapes seem indebted to 20th-century Western ideals. 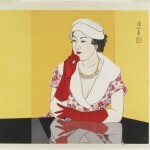 Other prints in the exhibition show women tentatively experimenting with modern approaches to femininity. 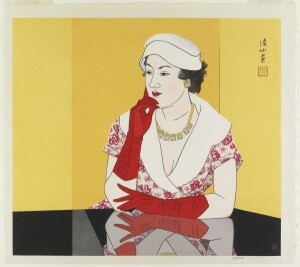 In Ito Shinsui’s Woman Looking at a Mirror (1916), the figure is seen from an unconventional angle, is boldly dressed in red, and has on red lipstick, something unthinkable in traditional Japan. As in classic ukiyo-e, Kabuki actors, with their outlandish makeup and costumes, provided rich material for shin hanga printmakers. Natori Shunsen, another of the “seven masters,” was particularly attracted to this subject. The Actor Matsumoto Kashiro VII as the White-Bearded Ikyu (1929) was definitely ready for his close-up when Natori got to him. The whiteness of the hair, eyebrows, and beard contrast wonderfully with the riotous color of his robe, which is covered with writhing green, gold, and red dragons on a deep blue field. In The Actor Nakamura Kichiemon I as Otokonosuke (1931) the artist revels in the rich orange and pale blue of the actor’s face makeup, which stands out against a background of dark gray. 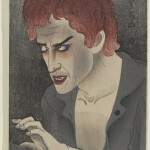 An interesting mix of Japanese and Western aesthetics and subject matter can be seen in Yamamura Koka’s The Actor Morita Kan’ya XIII as Jean Valjean (1921). Shin hanga are by no means daring experiments in modernism. The movement was a fundamentally conservative attempt to keep a classic art form relevant and reestablish it in the art market. That attempt succeeded for several decades, producing beautiful and appealing works aimed at a select audience of connoisseurs. However, the fundamentally democratic and wildly inventive spirit of ukiyo-e had to wait a little longer to be reincarnated—as manga, poster art, and Japanese Pop.